Prime members only. Take the Honey Nut Cheerios 19.5-oz. Family Size Box for free with AmazonFresh. Plus, free shipping on orders of $50 or more. (Otherwise, delivery adds $9.99). 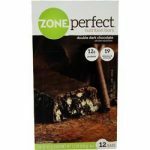 The price on these Zone Perfect Nutrition Bar (12/pk) will be added to your cart for $8.50 at All Star Health. Available in Choc. Chip Cookie Dough flavor for this price.